The picture shows a suggestion. The stand is not included in the price but can be hired separately. 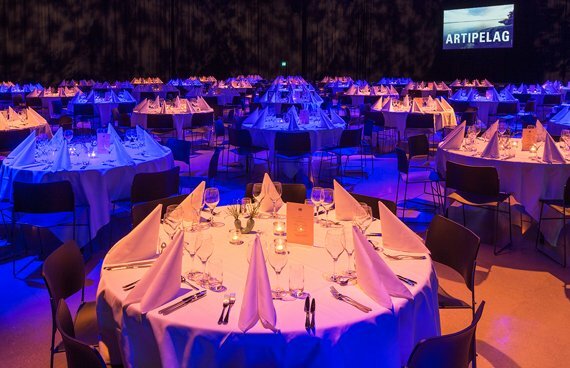 Artipelag’s event hall Artbox, located on the second floor, offers endless possibilities for activities in a unique environment. This impressive and multifunctional hall with an area of 1,200 m2 is the only one of its kind. The technical infrastructure makes it possible to quickly and easily build your event according to your specific requirements. 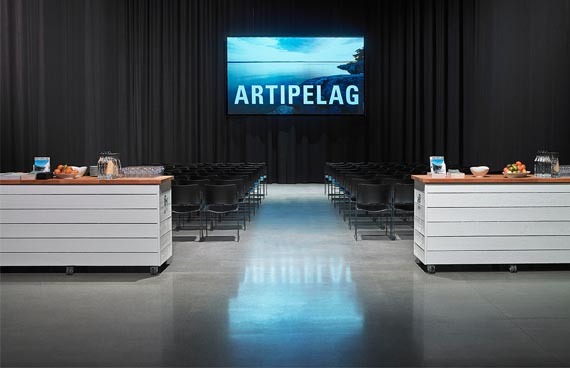 The Artbox is adjacent to Artipelag’s entrance hall, which is a perfect location for groups to mingle. Black wool curtains hanging from tracks, enough to cover the entire room with 50% folding capacity, 200 metres of fabric. Ten sections of 12m Prolyte S36R trusses. Each and every one of the trusses can carry 900 kgs, centre point load. The hoists are controlled using wireless remotes. There is power at every truss and DMX. 40 x Martin Mac Aura – moveable lamps to lighten fabric, stage, floor etc. Eight VL1100 – moveable lamps as front – back lighting in stage or gobo projections on the walls. 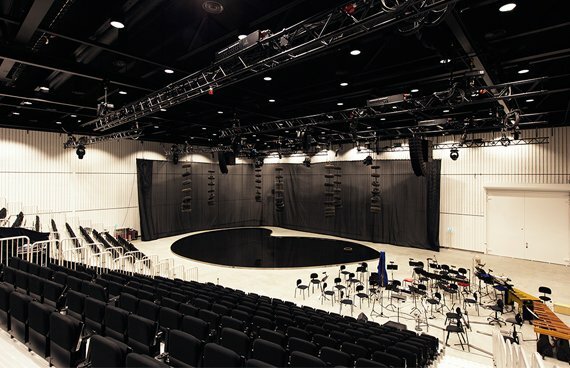 Sound system consisting of PA from L-ACOUSTICS – enough to create a strong and even sound pressure over the entire space for concerts, events and conferences. In the walls and floor, a signal distribution with power, Internet, sound and light is prepared. Over 1,000 amperes spread around the space is available. A large doorway for trucks is available for easy unloading and loading. 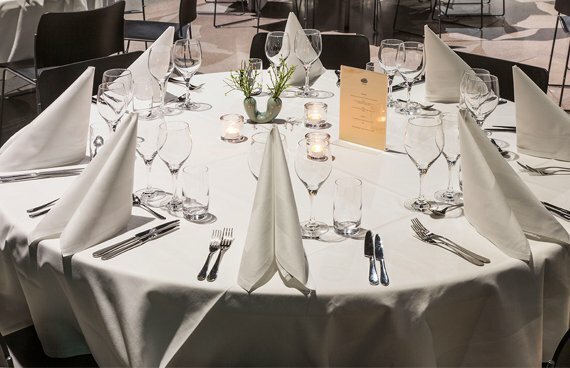 Introducing a new meeting package in our unique Artbox for 100 persons or more. 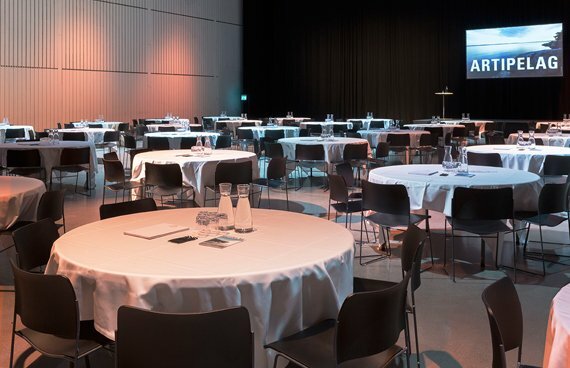 Choose between three different one-day conferences in Artipelag’s beautiful and flexible rooms. 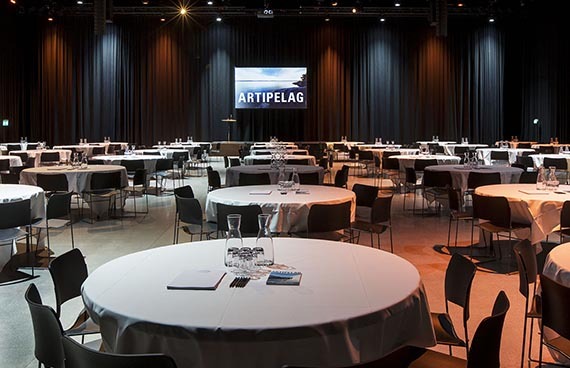 In all meeting packages, transport is included to and from Artipelag.